On Saturday ,November,18,2017,Ghana woke up with the shocking news that one of her meticulous broadcast journalists KABA had passed away. It was first emerged that KABA who died in his prime age was rushed to the Surgical/Medical Emergency (SME) Unit of the Korle-Bu Teaching Hospital (KBTH) Saturday dawn in a car dead on arrival. The second account had it that the Ekosii Sen host on Asempa FM was rushed from his Tesano home to the hospital, whilst another said he was brought in from a prayer camp (whose name is being held for security reasons) close to Nsawam. 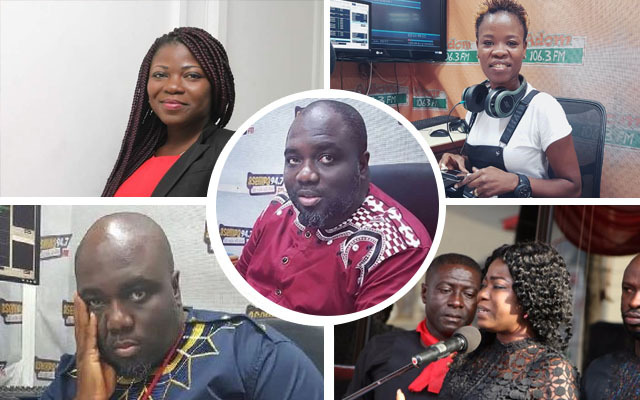 Just as the entire nation struggles to come to terms with the untimely demise of this selfless broadcaster ,ace broadcasters Afia Pokuaa and Ohemaa Woyeje staff of the Multimedia Group,had come out with repugnant revelations. In her social media post,Ohemaa Woyeje, the host of ‘Work and Happiness’ on Adom FM revealed that the late KABA told her a few weeks ago, how a woman at Multi TV frustrated KABA especially during his days on TV. Though Ohemaa Woyeje failed to name the person, she further described the person's tears and mournful act as fake. Afia Pokuaa also In a Facebook post on Wednesday,wrote: “Why do we use juju and evil means to kill each other and undermine each other when we came individually?”. The ace broadcaster who seems to have known the culprit who is purported to have used ‘Juju’ to kill KABA also couldn’t identify that culprit. As people who have openly showed their love for KABA, wouldn’t it be prudent for Afia Pokuaa and Ohemaa Wuyeje mention the names of the Culprits? As a plausible Online News Surgeon,after taking analytical look at the whole scenario,Afia and Ohemaa’s revelations are trumpeting in my ear drums that they are really hiding something. Oh Yes,i (Online Surgeon) recollected swiftly that, they worked with the late broadcaster and like the Akan proverb,”Aboabi Be ka wua, Efiri Wuntumamu”, meaning If an insect will bite you it will definitely come from your cloth,the management of Multimedia and the family of KABA must approach their repugnant revelations with much seriousness. Afia Powuaa and Ohemaa Woyeje must quickly be investigated in order to mention the names of those culprits.